View more presentations from Genlighten.com. What should we call this index? If you search the Family History Library Catalog at FamilySearch.org you will find a resource listed under “Illinois, Cook, Chicago - Vital records – Indexes” called "Indexes to deaths in the city of Chicago during the years 1871 to 1933 : showing name, address and date of death" created by the Chicago Board of Health. It’s a very long, descriptive title, but it’s somewhat misleading. It’s true that most of the people listed in this index died in Chicago, but the index also includes people who died outside the city. And, in fact, a note in the catalog says, “These indexes are believed to be for burial permits, the actual deaths having occurred both in and outside the city of Chicago, often times out of state.” That’s probably why some researchers call it the “Burial Permit Index,” but that’s misleading, too. As far as I’ve been able to determine, the numbers given in the index don’t lead to burial permits; they lead to death certificates and/or death register entries. For lack of a better title, I often refer to the index as the “Chicago Death Index, 1871-1933” (CDI) as a short way of distinguishing it from the Illinois Statewide Death Index online. The CDI is arranged alphabetically by surname, then given name, then death date. For example, a John Smith who died in 1888 will appear before a John Smith who died in 1902 and both will appear before a John C. Smith who died in 1872. Each entry includes a name, a place of death, a death date and a few codes and numbers which I’ll talk about later. What makes this index useful? I’ll list a few answers to this question and then illustrate the points with a case study from the lookups that I did today. · The index includes deaths between 1871 and 1878 that aren’t in the online index. If you find an early entry here, you can be pretty sure that the county clerk’s office will be able to provide you with a transcription of the record if you send in a $15 request. · The index lists place of death. If the death was in Chicago, you’ll see a street address. This can be very useful if you’re trying to figure out when someone with a common name died if you have a last-known address from a directory or census or other source. If the death was somewhere else, you’ll see a city and state. Sometimes people who are buried in Chicago aren’t in the online index because they died some place else—like Michigan. A quick check of the CDI can sometimes save a lot of time and frustration trying to pull an index entry out of the online index when it just isn’t there. 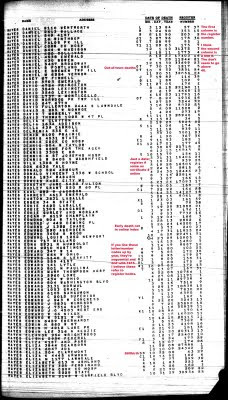 Out-of-town death records for 1909-1915 are available on FHL microfilm. In most cases, though, I think it's best to try to get a copy of the original death record from the place where the person died. · Sometimes names are spelled differently in this index than they are in the online index. · Sometimes a year is wrong in the online index. Cross-checking with this index can help you figure out where to look for the death record. So what about the numbers in this index? This index appears to provide register numbers. 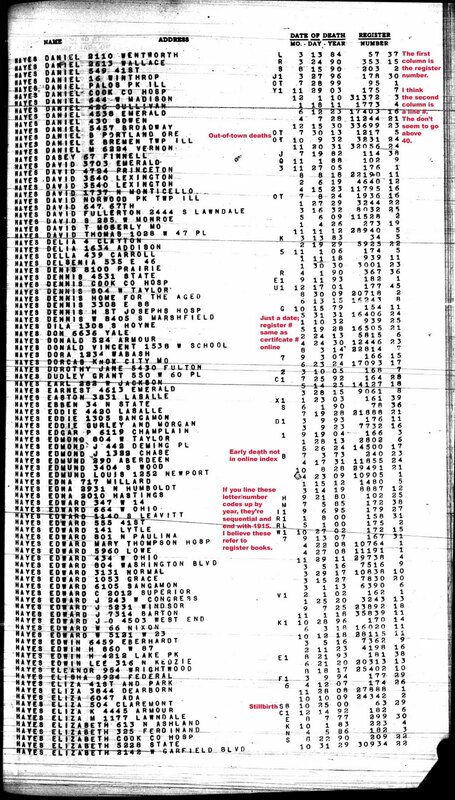 For deaths from 1916 forward, the register number is the same as the certificate number from the online index and you can use it to locate the actual record on FHL microfilm. For deaths between 1878 and 1915 the register number is different from the certificate number and it can’t be used (directly) to find a death certificate on FHL microfilm. However, if a name is in the index, it’s very likely that there is a corresponding index entry in the online index and it’s worth digging for it using Stephen Morse’s One Step access if it doesn’t pop up immediately. So, how about a case study? In the CDI, one of the two was listed with the same address of death as Minnie—most likely the record the client was searching for. August was a bit more difficult. I went back to the online index and was able to pull up the matching entry. It was listed under the initials G. F. but based on the address of death it was the match. I might have stumbled on the index entry for G. F. if I had looked closely at death dates for every Smith who died between 1890 and 1892 (I often broaden the date range because sometimes dates are wrong) but the Chicago Death Index made the search much simpler. Now the question is this: If the death certificate just has initials, where did the name listed in the CDI come from? If I figure it out one of these days, I’ll post! This evening, I was looking for online newspapers that might help me with a bit of research I'm doing on a composer by the name of A. S. Bowman (I'll blog about him soon) and I stumbled on a resource that might be of interest to those of you who have Polish ancestors in Chicago. It looks as though the first ten years (1908-1917) of Dziennik Zwiazkowy, “Chicago’s largest and oldest Polish newspaper,” are available online for free. The newspaper is part of the University of Illinois at Urbana-Champaign's Illinois Digital Newspaper Collection. Other titles include Barrington Review, Southern Illinois Journal, and several newspapers from Quincy. For online newspapers from other states, check out Penn Libraries research guide titled Historical Newspapers Online. It's the web page that led me to the Illinois newspaper page.